Lethbridge is widely regarded as a sports town. This city has a storied history of sports, but the Galt Museum has decided to explore the present in their new exhibit “Champions and Challenges in Sports” which opens, May 12, with the official kick off at 2 p.m. May 13. There will be a variety of the subjects in the exhibit present including Kris Versteeg, Lethbridge Sports Hall of Fame inductee Brad Brown, referee Bill Halma, Special Olympics downhill skiing medalist and bowler Tyler Birch, curler and Special Olympics powerlifter Jennifer Grimes and sports advocate, and exhibit advisory committee member Knud Petersen. Curator Wendy Aitkens with the help of University of lethbridge applied studies student Stefanie Heidebrecht and much community support, decided to tell some of the stories of not only professional athletes, but amateur athletes, families, referees, sports boosters and fans, to convey a cross-section of the contemporary Lethbridge sports community. “ There are a lot of athletes in Lethbridge from professional athletes, to recreational athletes playing in beer league slo-pitch,” said curator Wendy Aitkens adding it was a challenge to choose the athletes to be featured in the exhibit. “We made 19 phone calls to interview some of these people. Then we put together 10 two-and-a half minute short video clips of the interviews. 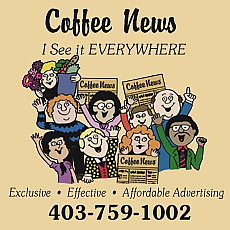 It was absolutely wonderful,” Aitkens observed adding the Galt did a history of Lethbridge Sports exhibit in 2001. In addition to the video stations, where patrons can relax on a comfy leather couch to watch them, there are also special displays dedicated to Lethbridge sports notables including former Lethbridge Hurricane Kris Versteeg, who has already won a Stanley Cup in the NHL, as well as special Olympians, a display on curling, jerseys and much more. The Galt Museum is getting ready to host the seventeenth annual historical fair, May 5. Numerous Grade 4-9 students have been hard at work researching their favourite aspects of Canadian history. We usually get 50 projects but we have no idea what they will be or how many they are until we receive them. One of the schools hasn’t registered yet,” said Belinda Crowson, who has been involved with the fair for the past dozen years. While some schools make the fair part of their curriculum, some students get so into their projects that they enter on their own. “ They do the research and decide which stories to tell and what to focus on or they do family stories, so they are personally involved and tell it from their own eyes,” Crowson continued. Nestled in between the Royal Bank parking lot and a big brick building including an accountant’s office and a naturalist’s shop, stands the Cleary House, an anomaly in the bustling downtown Lethbridge business community. The lone remaining coal miner’s shack, located at 422-7th Street South, originally built in 1906 is the sole remaining relic of a bygone era in Lethbridge — a bright white, cheerful looking house with beautiful arches and a front porch braced by a black wrought iron fence, surrounded by a sea of red brick and yellowing mortar. 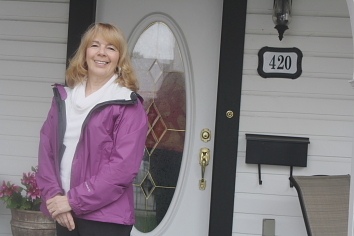 “A lot of people are curious about the house,” said current owner Lorraine Moodie. Moodie and her husband bought it at the estate sale in 2006 of longtime owner Alberta Chamberlain, who lived there alone for close to 50 years. She was best known as the lady with the Chow dog, because she used to have a little Chow dog she walked every day. “I didn’t really know her, only to see her and say hello to her and her dog,” Moodie said. The Downtown core used to feature numerous such houses but slowly but surely were replaced by businesses as Lethbridge grew and the owners sold. The Cleary House is one of five sites chosen this year to be marked by historical markers/ plaques on May 12 at a ceremony to be held in front of the house. The other sites are Hotel Dallas/Coalbanks Inn, 312-5th Street S. (built 1903); Lethbridge House Hotel/Lethbridge Hotel, 202-5 St. S. (built 1885) ; Burns Building/Shanghai Chop Suey, 608-610 3 Ave. S. (built 1911); Berte Grocery/George’s Groceries & Meats/Williams Grocery/Tumbleweed Café, 707-9th Avenue N. (built 1910). The Galt Museum is celebrating Earth Day, April 22 by taking a look at the faces of our locally produced food. 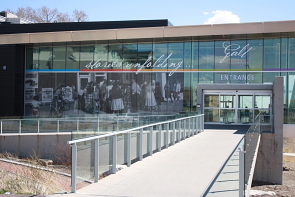 So for Earth Day, April 22, the Galt Museum in collaboration with Slow Food Alberta, will be inviting numerous food producers to talk about producing environmentally friendly food and, even better, offer free samples. There will be everything from home grown garlic, worm compost, home made granola bars and sausages plus a lot more. Earth Day is a cultural celebration which began in 1970. The Galt is pleased to be holding a variety of Earth Day activities, April 22 from 1-4 p.m. The event fits in perfectly with their latest exhibit on climate change. Jackie Chalmers, president of Slow Food Southern Alberta noted buying food form local producers not only helps the earth by reducing fuel consumption due to transportation costs but also processing costs. Plus when you talk to a local producer, you can ask exactly what goes into the production of food. “It’s a real neat opportunity to talk to people about where there food comes from,” she said of participating in the Galt Museum’s Earth Day celebrations. Slow Food Southern Alberta has produced a directory featuring over two dozen Southern Alberta producers complete with biographical information and contact information. But you will be able to ask many of them in person at the Galt, and sample their wares. 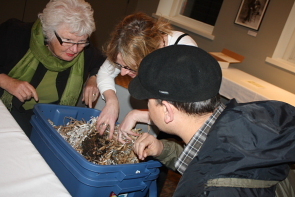 The Galt Museum is going green for their latest exhibition, which opened Sunday, Jan. 22 from 1-4:30 p.m. The travelling exhibition “Earth’s Climate In the Balance,” runs Jan. 22 until Earth Day, April 22. Galt Museum Curator Wendy Aitkens noting the purpose of having this exhibit is to spark discussion about environmental issues. “There is a difference between weather and climate change. Weather is what you see when you step outside your door. Climate change is long term over millions of years,” she said. 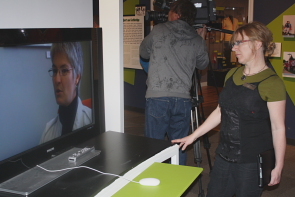 She noted the museum plays an integral role in educating the public about issues like this through their exhibits. “We have pretty serious environmental concerns. This exhibit tells you how to mitigate your environmental impact,” she continued. The exhibition comes from the Bruce County Museum and Cultural Centre in Ontario and explores the historical aspects of climate change. There are a variety of displays explaining the history of climate change as well as the materials and methods scientists utilize to study climate change. Aitkens was interested in the display featuring extinct species. “We had a number of extinct species here in North America,” she continued. Another interactive display examines how humans can reduce their eco-footprint. Activities included a test of environmental knowledge and a calculation of ones environmental footprint. 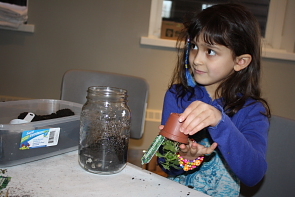 A special activitiy allowed the Galt Museum to “recycle” leftovers for their Saturdays at One program — voluteers and staff were helping make terrariums (their own mini-ecosytems) out of rocks, charcoal, black dirt, a plant and a screen.